6508 ✉ 70I 30 Pfg. Monetary reform vitims with plate flaw \"additional vertical hatching stroke\" in mixed franking with American/British Zone 2 Pfg. 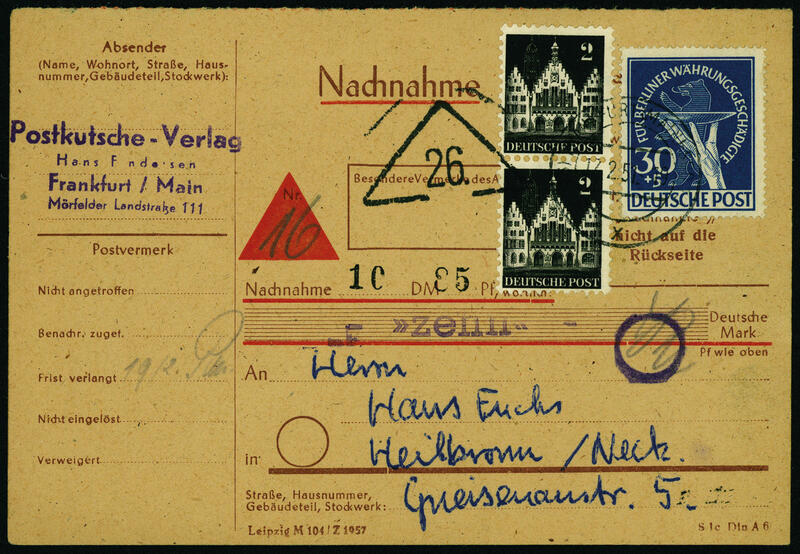 Buildings in the vertical pair, correctly franked on Cash on Delivery card from \"FRANKFURT 17.2.51\" to Heilbronn. In this kind seeming unique and extraordinarily decorative! Photo expertize Eliades BPP. 6509 Bl.1 Monetary sovenier sheet 1949, fresh colors and in perfect condition mint never hinged, without any signs. Michel 950,- €. 6510 Bl.1 Monetary sovenier sheet 1949, fresh colors and in perfect condition mint never hinged, without any signs. Michel 950,- €. 6511 Bl.1 Monetary sovenier sheet 1949, fresh colors and in full original size, in perfect condition mint never hinged, without any signs. Michel 950,- €. 6512 Bl.1 Monetary sovenier sheet 1949, fresh colors and in full original size, in perfect condition mint never hinged, expertized Schlegel BPP. Michel 950,- €. 6513 Bl.1 Monetary sovenier sheet 1949, fresh colors in full original size, in perfect condition mint never hinged, expertized Schlegel BPP. Michel 950,- €. 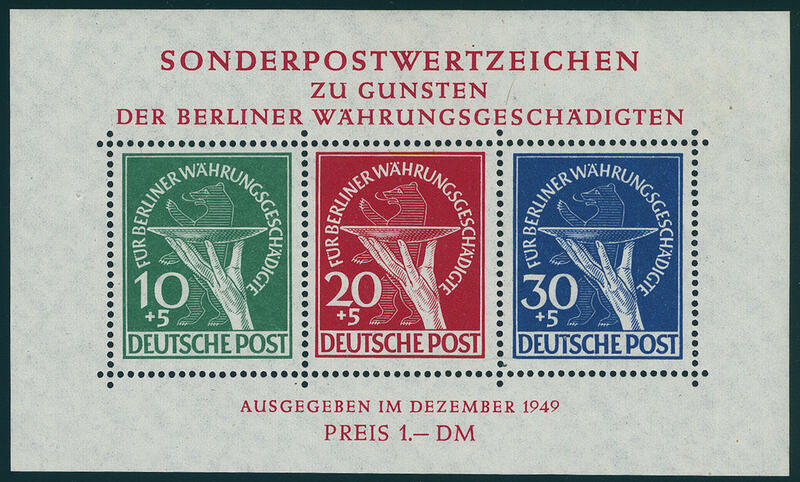 6514 ⊙ Bl.1 Monetary sovenier sheet 1949, fresh colors and in full original size with two perfect first days special cancellations \"BERLIN day the Need partnership 17.12.49. \". Photo expertize \"the quality is perfect\" Hans-Dieter Schlegel BPP. Michel 2200,- €. 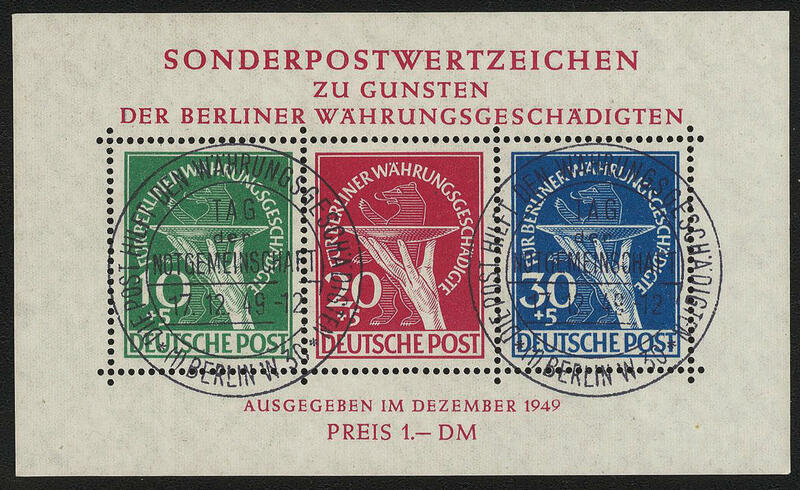 6515 ⊙ Bl.1 Monetary sovenier sheet 1949, fresh colors and in full original size with two perfect first day special cancellations \"BERLIN 17.12.49. \". Photo expertize \"the quality is perfect\" Hans-Dieter Schlegel BPP. Michel 2200,- €. 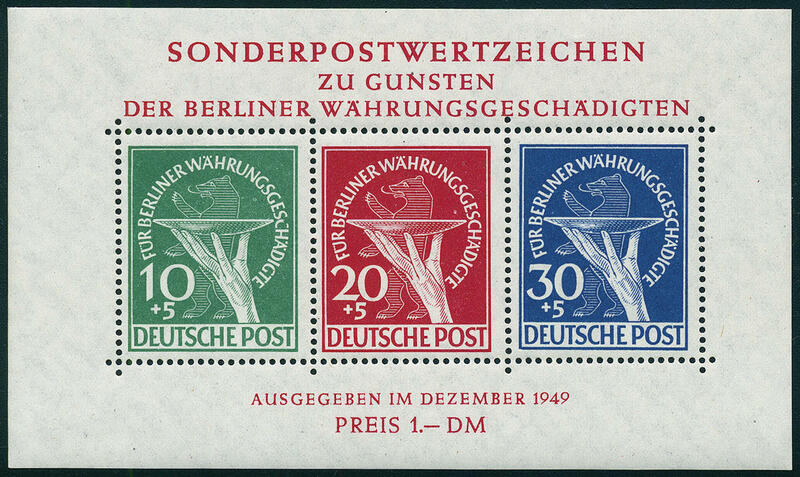 6516 ⊙ Bl.1 Monetary sovenier sheet 1949, fresh colors and in full original size with two perfect first day special cancellations \"BERLIN 17.12.49. \". Photo expertize \"the quality is perfect\" Hans-Dieter Schlegel BPP. Michel 2200,- €. 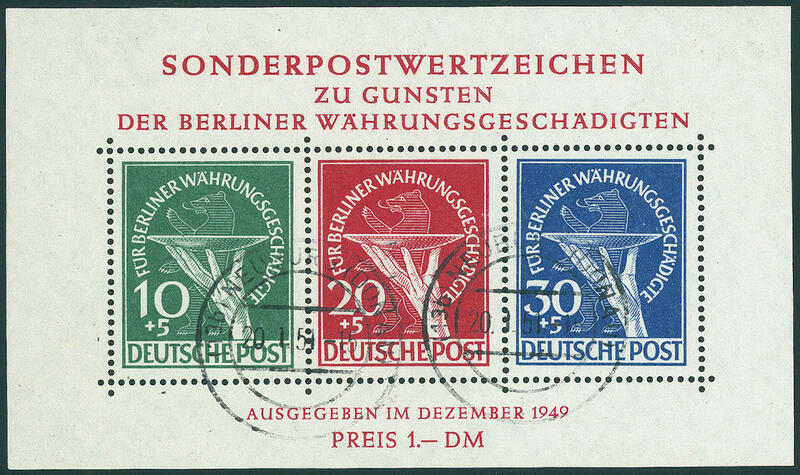 6517 ⊙ Bl.1 Monetary sovenier sheet 1949, fresh colors and in full original size, at the bottom on the right corner crease, as far as in perfect condition with two neat and clear mounted first days special cancellations \"BERLIN 17.12.49. \". Photo expertize Hans-Dieter Schlegel BPP. Michel 2200,- €. 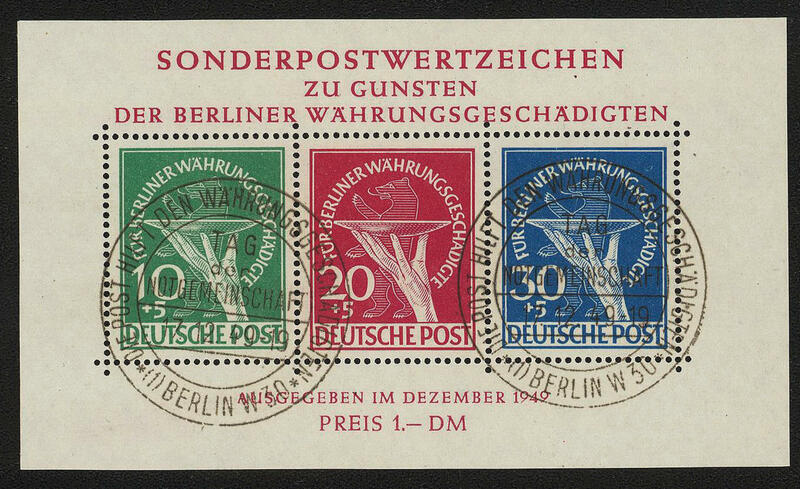 6518 ⊙ Bl.1 Monetary sovenier sheet 1949, fresh colors and in perfect condition with appropriate special cancel from Berlin, souvenir sheet genuine, stamp to of our Opinion faked. 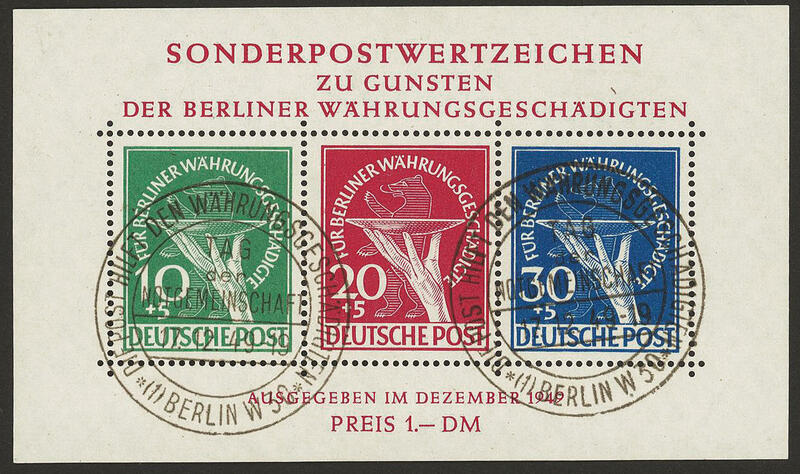 6519 ⊙ Bl.1 Monetary sovenier sheet 1949, fresh colors and in perfect condition, neat cancelled \"BERLIN When lake 21.12.49\". 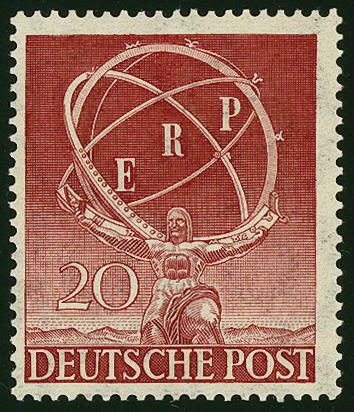 Souvenir sheet genuine, stamp faked, accordingly expertized Schlegel BPP. 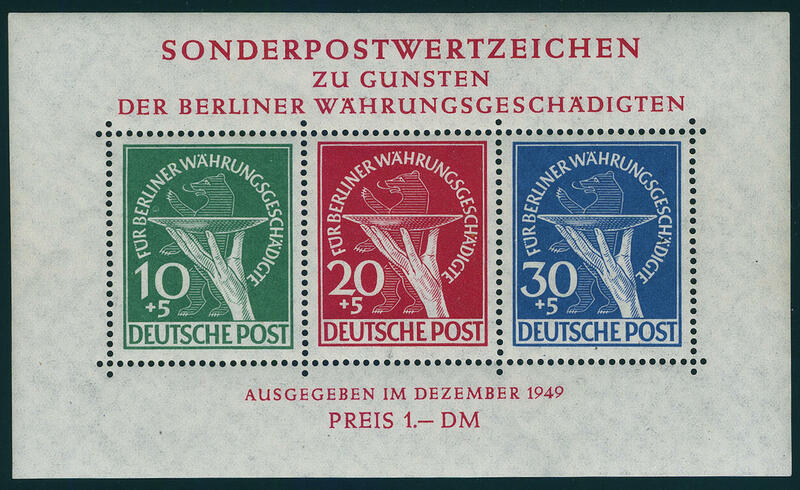 6520 ✉ Bl.1 Monetary reform victims souvenir sheet 1949, fresh colors and in full original size, as correctly franked single franking on very nice registered cover with appropriate special cancel \"BERLIN the post helps the monetary reform victims 18.12.49. 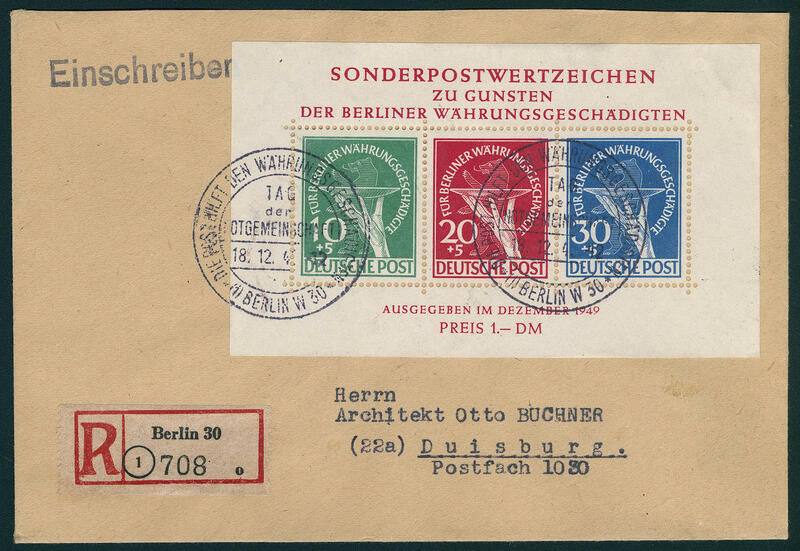 \" to Duisburg with arrival postmark. A wonderful cover in perfect condition! Photo expertize Schlegel BPP. 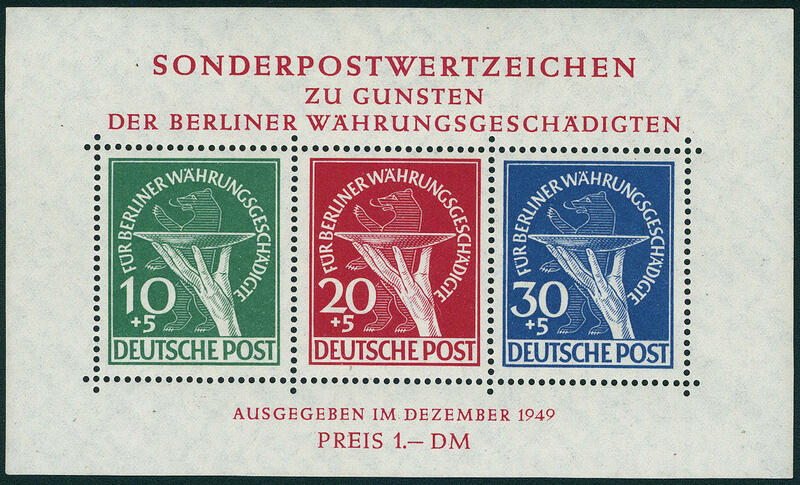 6521 ⊙ Bl.1I Monetary sovenier sheet 1949, fresh colors and in full original size with plate flaw \"additional vertical hatching stroke IN patera over small finger\", fresh colors and in full original size, neat cancelled \"NEUBURG 20.1.51. \". Photo expertize \"the quality is perfect\" Andrew Schlegel BPP. Michel 3200,- €. 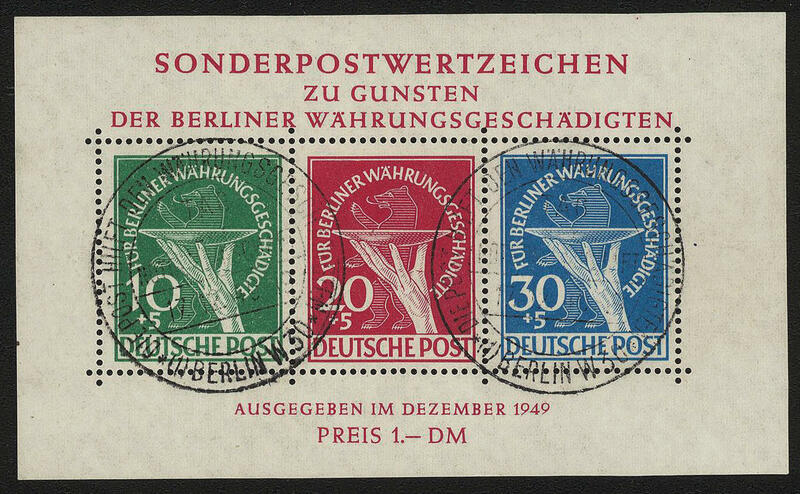 6522 ✉ Bl.1I Monetary sovenier sheet 1949 with additional franking American/British Zone on commercially used, nearly correctly franked registered air mail letter from \"BÖSPERDE 27.12.49. 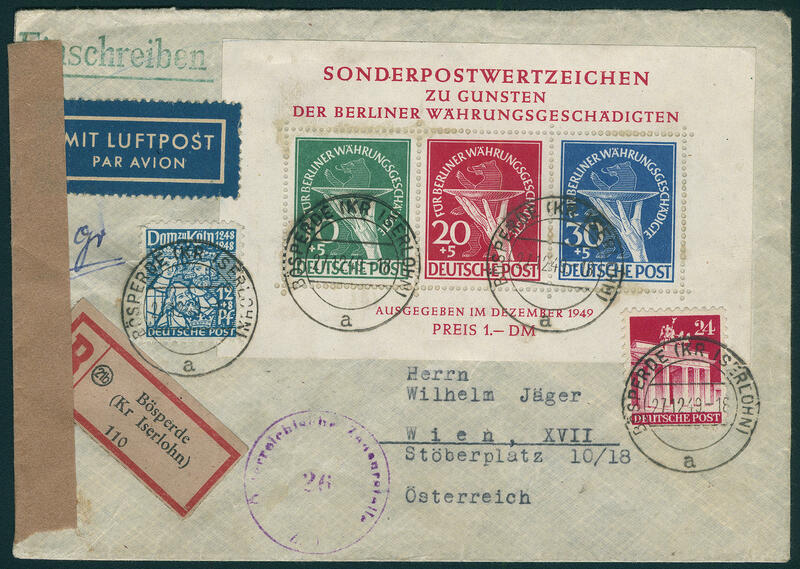 \" with censorship strip and censorship stamp to Vienna / Austria. 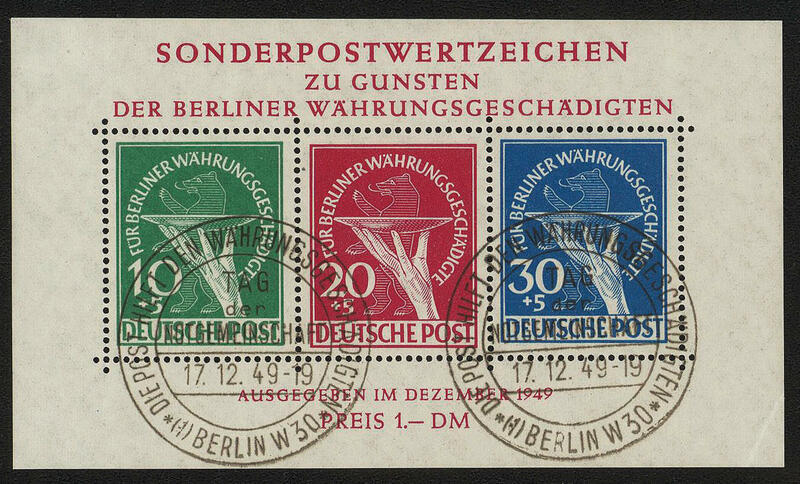 A scarce international franking of the currency souvenir sheet with all extraordinary franking combination and associated with the plate flaw a significant Berlin rarity! Photo expertise Hans-Dieter Schlegel BPP. 6523 Bl.1II Monetary sovenier sheet 1949 with both plate flaws \"10 PFG. With break in the C IN monetary reform vitims\" and \"30 PFG. With additional vertical hatching stroke\", in perfect condition mint never hinged, expertized Schlegel BPP. Michel 2500,- €. 6524 ⊙ Bl.1III Monetary sovenier sheet 1949, as well the 10 Pfg. 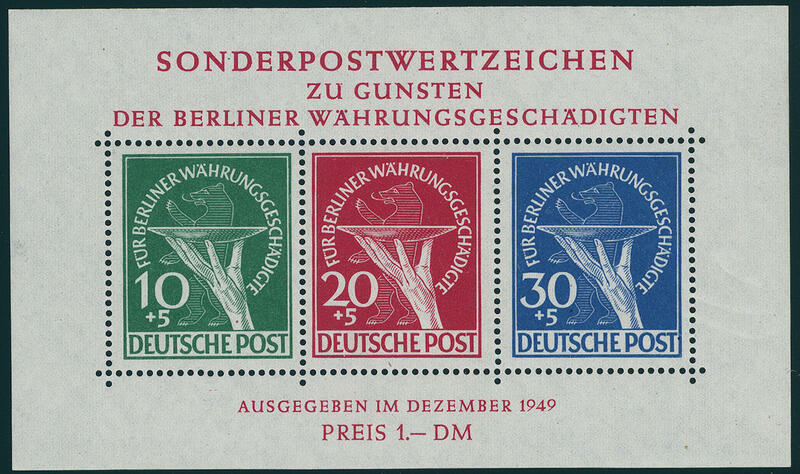 With plate flaw \"green dot right at the wrist\", fresh colors and in full original size with two perfect first days special cancellations \"BERLIN 17.12.49. \". Photo expertize \"the quality is perfect\" Hans-Dieter Schlegel BPP. Michel 3500,- €. 6525 71Y 20 Pfg. ERP 1950 with rare variety \"missing ring in the watermark\", in perfect condition unused. An extraordinarily scarce variety! 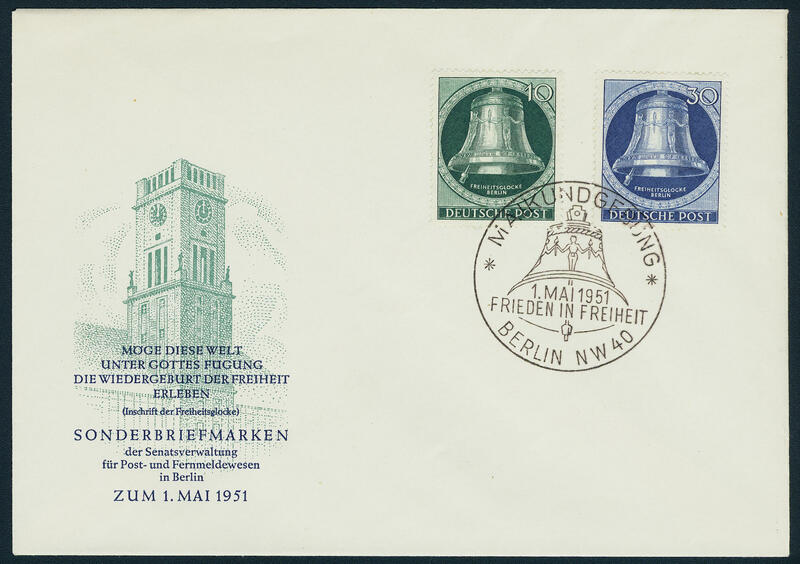 6526 FDC 75/79 Bell left 1951 on illustrated First Day Cover respectively First Day postal stationery with first day special cancel \"BERLIN May demonstration 1. 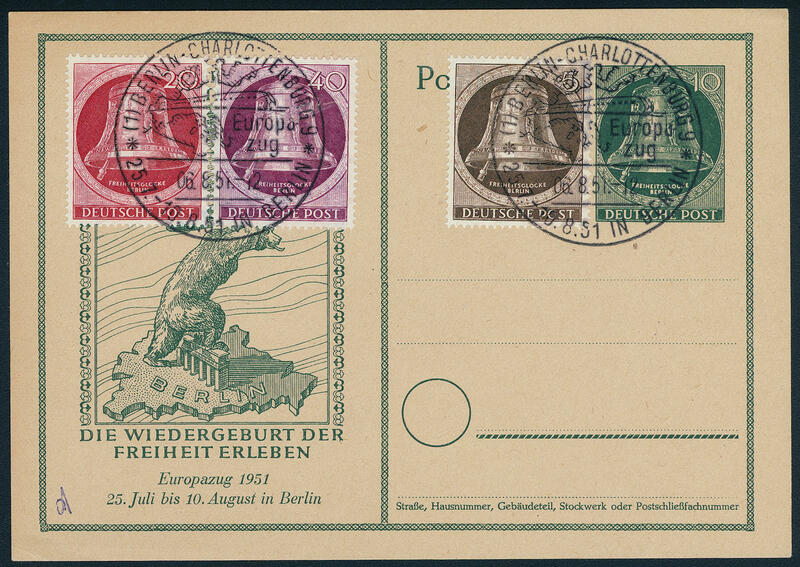 May 1951\" respectively \"BERLIN-CHARLOTTENBURG Europe train 6.8.51. \", rare, signed. Michel 2700,- €. 6527 ✉ 76,78 10 Pfg. And 30 Pfg. 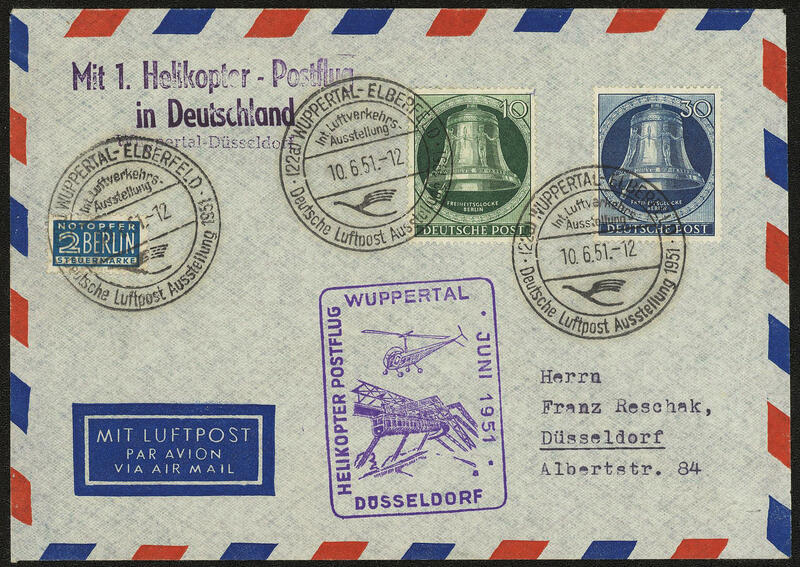 Bell left on very nice helicopter post cover with first day special cancel \"WUPPERTAL-ELBERFELD 10.6.51. 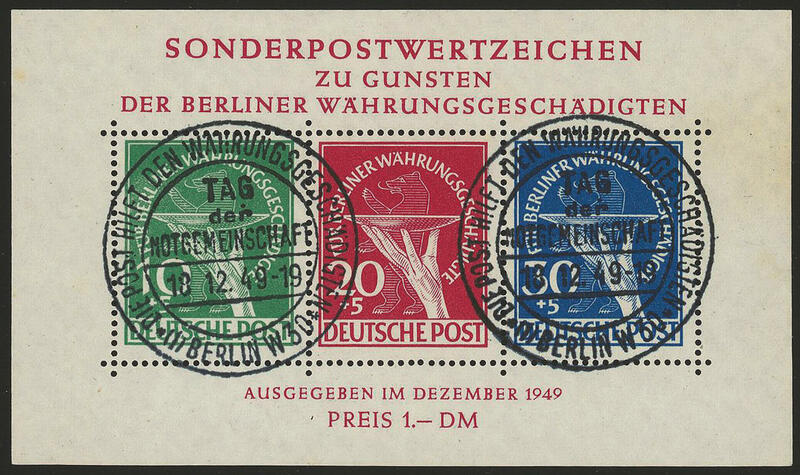 \" with special confirmation stamp to Düsseldorf.